Angel A. Juan, Maria A. Huertas, "Teaching Mathematics Online: Emergent Technologies and Methodologies"
Educational technologies (e-learning environments or learning management systems for individual and collaborative learning, Internet resources for teaching and learning, academic materials in electronic format, specific subject-related software, groupware and social network software, etc.) are changing the way in which higher education is delivered. 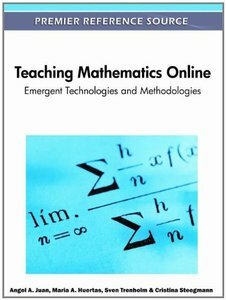 Teaching Mathematics Online: Emergent Technologies and Methodologies shares theoretical and applied pedagogical models and systems used in math e-learning including the use of computer supported collaborative learning, which is common to most e-learning practices. The book also forecasts emerging technologies and tendencies regarding mathematical software, learning management systems, and mathematics education online and presents up-to-date research work on how mathematics education is changing in a global and Web-based world.